The Japanese Cards of the Day for May 23rd are one of the lowest-rarity cards and the highest-rarity card from V-Booster Set 01: Unite! Team Q4, the Common Cat Butler and the Image Ride Rare Blaster Blade. When Cat Butler first debuted in Extra Booster 1: Comic Style Vol. 1 seven years ago, the card was seen as something of a joke. It was a conditional restand Itou had made for Miwa's deck in the manga that allowed him to get a dramatic second attack in with Boomerang Thrower, but being limited to grade 2 cards made it a highly situational grade 0 that hurt the consistency of one's deck, and the cost of retiring itself meant it was a net-neutral exchange to get an additional attack and drive check. 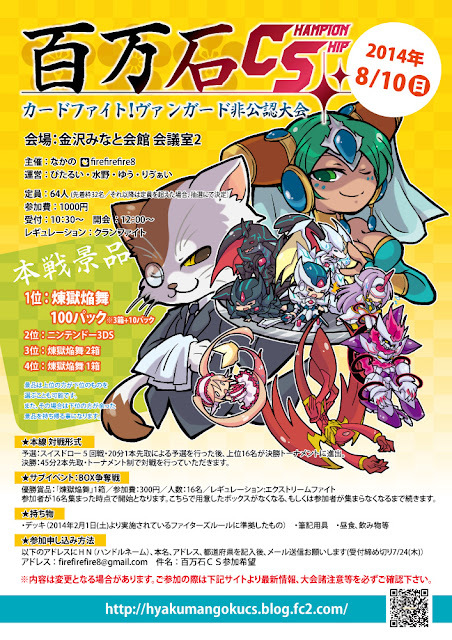 Cat Butler on the poster for the Hyakumangoku VGCS, August 2014. That joke turned lethally serious thirty months later when Booster Set 16: Legion of Dragons and Blades introduced the Legion mechanic, which allowed one to have two cards on the vanguard circle by using a grade 3's Legion ability to combine it with a grade 2 card from the deck. The official ruling from Vanguard R&D was that, since at least one of your vanguards was a grade 2 while in Legion, Cat Butler's skill would meet its check timing and could be resolved to stand the vanguard at a net +1. This gave birth to one of the most terrifying decks of the format; Ultimate Raizer Mega-flare, who after boost swung ~26k 2 critical and restood if its attack didn't hit. Put two Butlers down and you were looking at six drive checks if the opponent kept blocking, otherwise they were forced to take 2 damage. Although for much of the format the deck was overshadowed in the public consciousness by the relentless dominance of Thing Saver Dragon, which made up for more than 40% of all decks played during its peak periods and secured many consecutive tournament tops, Cat Butler Raizers was an overwhelmingly problematic matchup that eliminated much of the interaction with the opponent and ultimately found itself on the restricted list. 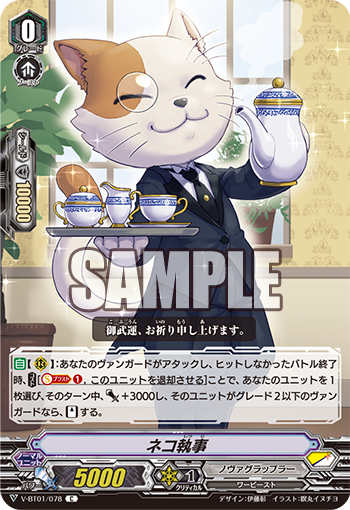 It's questionable if the new Cat Butler will replace the old one in the Premium format, as the new Butler is restricted by soul while the old one simply worked. Thankfully, Standard doesn't need to worry about Legion. The ideal targets for Cat Butler in the new format are Cup Bowler or Iron Killer to make a 17k restander versus grade 2s vanguards and 12k bases, or Hi-powered Raizer Custom to get another chance at your on hit. One option is to attack with your vanguard unboosted to make it easier for the opponent to guard (or to take advantage of them having a higher base power than you) then pass any trigger effects onto their booster and restand the vanguard with Cat Butler for a second drive check. (e.g. you attack with Hi-powered for 9k vs a 10k vanguard, drive check a Critical Trigger, give the power to a grade 1 behind Hi-powered and the Critical to Hi-powered, then stand Hi-powered with Cat Butler and swing boosted for ~22k 2 crit.) Another niche use is to allow a vanguard Raizer Custom to attack twice on the very first turn of the game, as his hand-to-soul cost pays for Cat Butler's. In this case, you get no trigger checks and any damage triggers by the opponent are liable to ruin the play. Unfortunately for the Butler, none of these strategies are inherently desirable. Staying on grade 2 isn't viable in the new format, and with no Legion grade 3s around there's no real incentive to run Cat Butler. He's an extra grade 0 that hurts your chance to ride successfully, and the only thing he brings to the table over simply riding to grade 3 is the extra attack. Twin Drive still works out to the same number of drive checks as a Cat Butler turn, but at a net increase rather than a neutral exchange that's negatively impacted by missing out on a turn of Twin Drive in the first place. 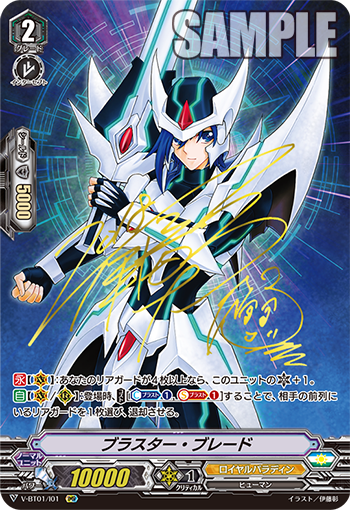 The second Card of the Day is the first Image Ride Rare, Blaster Blade illustrated and autographed by franchise creator Itou Akira. The mechanics of this card have already been discussed, but there's room to expand now that we know the full set of support for Royal Paladin in 2018. CONT [Vanguard Circle]: If you have four or more rearguards, this unit gets Critical +1. AUTO [Vanguard/Rearguard Circles]: When placed, [Cost: Counterblast 1 & Soulblast 1] choose one of your opponent's rearguards in the front row, and retire it. Much ado was made about Blaster Blade's extra critical when the card was first leaked. The condition is fairly easy to meet via High Dog Breeder Akane or Conjurer of Mithril's superior call skills, and it does dramatically escalate the progress of the fight by potentially dealing 3-4 damage in a single turn and pressuring the opponent to guard. It also falls prey to one of Vanguard's fundamental balancing mechanics, counterblast. By giving the opponent so much damage so early, you actually risk being retaliated against with an overwhelming number of skills; give Kagerou too much damage too soon and you'll quickly be staring down Striken, Dragonic Overlord, Berserk Dragon, and Nehalem all going off in the same turn when they are normally balanced by their mutual exclusivity. By giving the opponent so much counterblast to work with, you undo their own limitations by making those skills no longer exclusive. What would have been a vanilla Berserk Dragon and Nehalem call instead becomes you losing two rearguards and the opponent getting to restand a 2 critical center. Then there's the issue that using Blaster Blade's retire skill slows down Soul Saver Dragon by a turn when you don't necessarily have much time beyond your second grade 3 ride to decide the game. Early testing has demonstrated that the retire skill is vital to taking out Burstraizer and other powerful rearguards in Nova Grappler, a matchup where SSD rarely comes into play, but in all other matchups Soul Saver is your primary closer. That means Blaster Blade's role in the Royal Paladin deck is for the most part as a vanilla call target for Alfred, and not for his critical or retire skills. As for the Image Ride Rare itself, early case openings have shown the card is a 1-per-case print if it's present at all. That means one in twenty booster boxes--most cardfighters will be satisfied with their Trial Deck Blaster Blades. Thankfully, IMR remains a vanity rarity and not a functional one like VR or RRR. 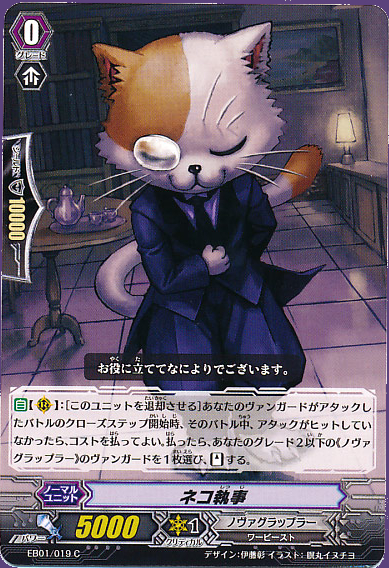 The previous Japanese Card of the Day was Silent Tom.